I know this may be a bit weird but whenever my parents buy toilet paper, I can subconsciously tell what brand it is by the texture and ridges. If it is Scott, Charmin, or another version. I do not have to see the label but I can tell the strength of it or its texture; soft or rough. 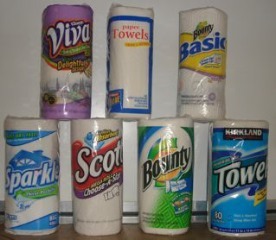 Or even the type of paper towels, Bounty has a distinct texture compared to store brands where they may have a different texture. Research is revealing the detail and variety of things you can perceive through proxy touch. It is something many people do not recognize at first hand but to those who are blind, they are able to distinctively recognize the texture of many things. I do not think that is weird at all! I can do the same thing with proxy touch, but with napkins. I am able to know which brand my parents have bought just by feeling the texture and thickness of the napkins through the packaging. I have even freaked them out a few times by knowing the brand without looking at the napkins haha. I just wanted to let you know that you are not alone!